I started out very strong. I was juggling several blogs and keeping them going (Because of a job change, one of my blogs will change). I found it easier to work on one blog at a time. Just keep notes on ideas for the other blogs until I am able to post. Keep blogging; keep creating and just keep on moving on. Things don’t always happen as planned. Problems with my computer and with the computer that I borrowed I wonder am I a magnet for bad electronics. Going to the library is good but an hour at a time is not good for a heavy duty computer like me. Using the computer at work (I checked, they let me post to my blogs on my breaks and lunch time) proved not to be as advantageous as I thought. It is hard to download pictures, write and post on 2 fifteen minute breaks and 1 half hour lunch. Now I just write the post, download to my jump drive and add the pictures as I POST. So now I will pick up where I left off. It would have so easy to start anew, but my word is my bond. So here it goes. I had the great pleasure to vend at the Mt. Carmel’s Women’s Health Conference on November 5, 2011. I have been doing this show for the last 3 years. Ms. Murphy is a wonderful coordinator and a very nice lady. That is here picture. Doesn't she look pretty?. I hope she doesn't mind me using this photo. I was suppose to use another photo, but I think this one is much better. I enjoy this show each and every year. This event is scheduled to help women of all ages, creeds and colors. First prayer, then women come together to share and learn. It is one of the best shows I have been to in a while. Ms. Murphy is the coordinator. She coordinates vendors, speakers, guest with ease and grace. The conference is free to all who want to attend. I have met many vendors at this event, but this year I wanted to include some other vendors on my blog. Now here comes the hard part. I had a accident with my vendor folder. It fell out of my bag and I lost some of the information concerning the vendors. WHAT ELSE CAN GO WRONG. I will start with what I have. Here we go. Beverly A. Burton is a consultant for Traci Lynn Fashion Jewelry. 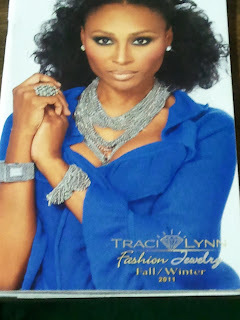 Traci Lynn Fashion Jewelry is a black owned jewelry company. This company was established in Philadelphia, in 1989 By Dr. Traci Lynn. You can reach Ms. Burton at 319-232-2862. Her email address is BabFrogprince@AOL.com. Ms. Burton gave me a catalog. She is a little camera shy, so I took a picture of her catalog. You make recognize the model on the front cover. It is Cynthia Bailey, an Atlanta Housewife. Impressive. As a matter of fact she graces several of the pages of this particular catalog. Go Mrs. Bailey. Please contact this young lady about some very beautiful jewelry. Jewelry that I would buy for myself. I make my own, but I am not high enough not to admire someone else’s handiwork. And it is marvelous. Since Traci Lynn Fashion Jewelry is sold from consultants to customers via home or office shows, personal shopping, and catalog orders. Give Ms. Burton a call. It will be a treat you will never forget. Until the next time.